Hello everyone and welcome to our second dev journal about the Stealth Mod we are making for the Sigil System. Last time we talked about the difference between Individual Stealth and Compound Stealth, and the different stealth-based actions you can take while skulking around and what their effects are upon each other. This time we will be talking about the central mechanic of the Stealth Mod: The Awareness Scale. The Awareness Scale is to the Stealth Mod as the Difficulty Modifiers are to the Sigil System. This Scale will be the central mechanic that all the rest of the Stealth Mod will be based around. Everything that you do while stealthing around a compound will, directly or indirectly, affect the Awareness Scale. Whatever you will be doing, you will either be increasing your mark along the scale or decreasing it. It really is as simple as that. Both narrative actions and mechanical Skill Check results will contribute to raising or lowering your Awareness Level, so you won’t need to worry about different rules for different actions you can take. The Awareness Scale works very simply: it describes the mood of the compound and the higher the level, the worse the mood is. Two things to remember. Firstly, as with last week’s dev journal, remember the difference between Individual Stealth and Compound Stealth. The Awareness Scale is all about the compound and not about the individual. So while individual enemies might know that you are in the compound and be actively searching for you, if they don’t report this to the compound at large, then the scale won’t ever go up. Only when the compound as a whole (or at least at a most) knows something is amiss is when the Awareness Level increases. Secondly, a compound is only as large as a GM wants it to be. It could be a single house or perhaps even a whole tower-apartment block or castle or star destroyer. However big the GM wants the compound to be is how big it is. This means that each compound does present a different challenge as Armed Patrolling (for example) is a much different scenario on a star destroyer than in a three bedroom house. In later dev journal we will be exploring and discussing the concept of “zones” and how a GM can chop up a compound in various zones. If and when that happens, each zone will have its own Awareness Scale that you will have to worry about, but at least it will all come in manageable chunks. 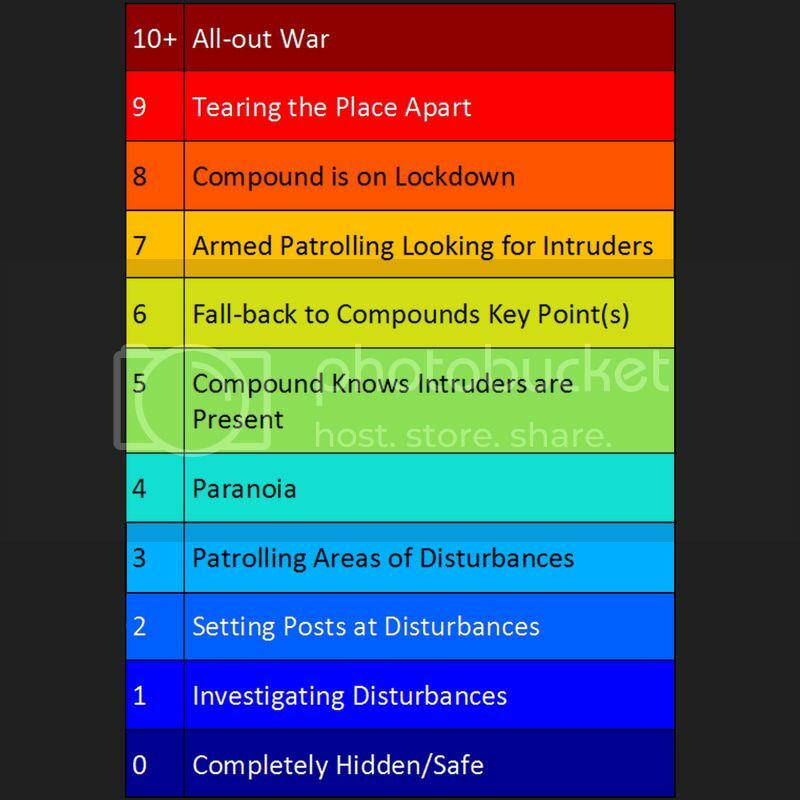 So there you have it: one simple scale that is all you need to concern yourself with as you sneak around enemy compounds. Next week in our Developer Journal we will start looking at all the actions you can take to increase and decrease the Awareness Levels on the Scale.